As many of you may know, I lived in Haiti for two years before taking my position with Mission Haiti Medical. Because of this, I had a unique perspective, knowing the ups and downs of Haiti life and also the tremendous amount of need for medical facilities. From everything I had heard before visiting, I was excited and knew it would be great, but I was pleasantly surprised by how great it really was. Below are my reflections on my first experience at the Hospital. The Staff: I was most surprised by the staff. When Kathy was introducing me, she helped everyone to understand my role of securing funds in the states. You could see each person go from happy to a genuine excitement when they understood what my role meant, especially the leaders of the hospital. They have the same hope, to grow as an organization helping even more people. When I could, I would wander around watching the staff in their specific roles. Everyone was always courteous, kind, professional, and truly cared for each patient that came. Through conversations you could see how appreciative they are for their job at the hospital. Even in America, it is hard to find staff who care as much as this staff does. What do they do different? This is what I found…Each member of the staff are paid on a regular basis, which isn’t typical in Haiti. Each member of the staff is shown love and appreciation by the leaders of the hospital and each other. Each member of the staff is recognized for special events such as birthdays, anniversaries, etc. building morale in the workplace. And best of all each member of the staff truly loves and takes pride in their roles. Throughout the week I was able to see that this hospital is life changing for the patients, as well as the staff. The Hospital: It is a beautiful, welcoming place. You can tell the staff like it to be organized, tidy and functional for all they have to do. 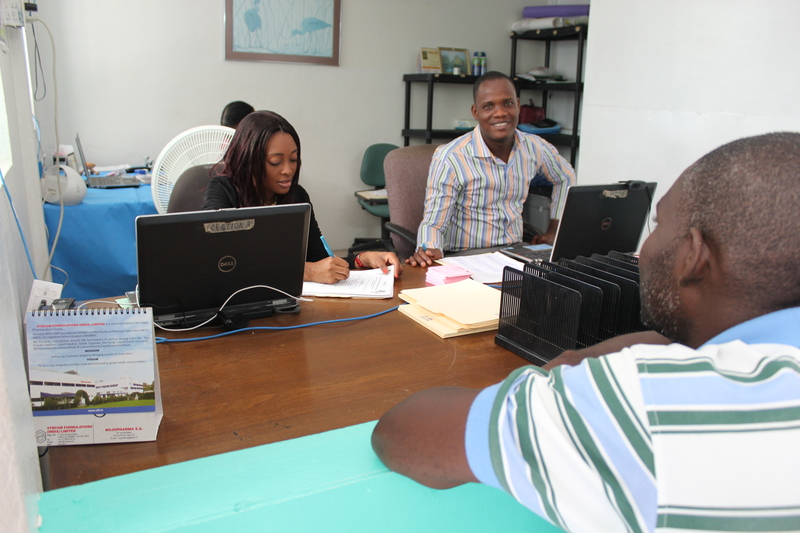 In Haiti, there aren’t doctor appointments so everyone comes in the morning and gets a spot in the order they arrive. As you can imagine, this can get chaotic, but they have a system for how they operate and it works. Each patient gets a card that they keep even after they leave and bring that card back when they return, this card holds the number to their medical records so a doctor can continue to update their file and make the best diagnosis. Once they have been seen by a doctor they are given a prescription and are able to go to the pharmacy to receive what they need and get direction on how to use each medication. Almost 40 different lab tests can be done at the hospital as well as Xrays, if needed. The emergency department started seeing patients the moment it opened on Monday and I was able to witness a few little miracles. The first patient was a tiny baby who was malnourished and dehydrated. The doctor and nurses made a plan, implemented it, and monitored the baby all day. At the start, it seemed the baby may not pull through, but by end of the day the baby was able to go home! I was also able to see a few newborn babies that were delivered in the hospital. They were precious. The Dental Clinic was so well equipped and functional, that it felt like a dental office in the states. The dentists were professional and thorough making sure to meet each patient’s needs. I watched the Prosthetist work with a sweet little girl who needed a brace to help straighten her leg. He measured and created a mold, and made a brace to fit. It was incredible to watch how he cared for the little girl and wanted it to be perfect. One of my favorite things I was able to see was a sweet women, Madam Wilbert Petit, who comes everyday to lead a devotion and pray for each patient. While I saw so much, there were a few things that I didn’t get to see. The eye clinic was a beautiful space, but they were not open the week I was there. I also missed the Malnutrition Care that comes weekly. But was able to hear about both of these from Mark and Kathy on my tour. After this trip to Haiti, I am so honored to be able to work for Mission Haiti Medical, knowing that the hospital is making a difference in so many lives.